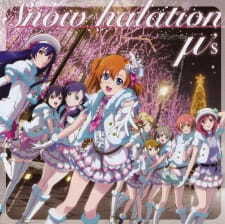 Snow Halation is the second single for μ's (Muse), the girls of Otonokizaka Academy from the mobile game and anime franchise Love Live! School Idol Project. It was released to celebrate Christmas in 2010, and serves as the ending song for episode 9 of Love Live! School Idol Project Season 2. The choreography of the music video features Honoka Kousaka, Umi Sonoda, and Nozomi Toujou, decided by popular vote. Other: Bokura no Live Kimi to no Life, Natsu-iro Egao de 1, 2, Jump!, Mogyutto "Love" de Sekkinchuu!, Wonderful Rush, Music S.T.A.R.T!! When I was a child I often used to visit my grand dad, especially in winter. During this season everything around his house was covered by a white mantle. Every night, when the city was lighting up, something wonderful was happening in front of my eyes: I could assist to a beautiful show called snow halation. Everything around was becoming progressively brighter and my heart was racing in front of such an emotional landscape. Many years have passed since then but this music video managed to renew those old sensations buried deep inside me. Snow Halation is not just a music video, it’s an experience. And it’s not a love song, but a hymn to life. It tells us to not be afraid to show our feelings, it fills our hearts with nostalgia but at the same time it leaves enough room for the excitement that future events will give. It teaches us that life is made of both happy and sad experiences and the ‘snow halation’ metaphor that Hata Aki wrote about describes perfectly this duality formed by the coldness of the snow and the warmth of halation that wraps around it. The animations in this video may not be the best but they still manage to be somehow charming and the choreography μ's performs is enjoyable. Its plot may be quite basic (you cannot expect much from a music video) but most will find it relatable and will appreciate it. The song is wonderful and the emotions it conveys are true and intense. ‘Snow Halation’ is one of the, if not the, best thing the Love Live franchise offered us and whoever had the luck to be born in the same era of this video should consider himself/herself truly blessed. Silvagunner made this song good. I know this song too well even more than the intro sequence songs. It very good song. Very catchy and upbeat. you can even make a good cover of it via piano, guitar, keyboard, drums, and synth. I especially like that this song appears in many of the rips on the channel, whether hidden or blatantly the theme of said rip. There exists a playlist of Snow Halation rips posted by the Siivagunner channel that unfortunately I cannot link. Some of things done to change Snow Halation to fit the base song include pitch shifting, using only the lyrics, using only the music, different instrument covers (of the base song's instruments) and/or using the base song to emulate Snow Halation. Overall, this song remains a timeless classic among the Love Live portfolio of songs, and honestly one of muse's best songs, if not the best. Take that chaste; good luck trying to find irrelevance or "trolling" with this one since it's a serious review.